As I have said many times, Kevin Eastman is one of my favorite coaches to study. I was fortunate this past July to meet him when he was here in Indianapolis putting on his Coaching U Live Clinic. Kevin was a long time college assistant and head coach. He served as an Assistant Coach for the Celtics from 2004 to 2013. At that time he made the move to Los Angeles with Doc Rivers and was on the coaching staff last year. This year he will be serving as the Vice President of Basketball Operations for the Clippers. 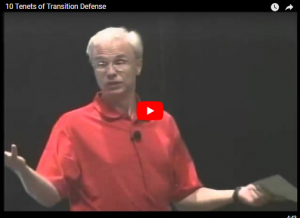 This video is a segment from his NBA Defensive Strategies and Teaching Points DVD. It is a part of his 8 DVD set which also includes High Intensity Skill Development, NBA Drills for All Levels, Stimulate Your Offensive Thinking, Strategies and Philosophy for Coaching Success, Stimulate Your Defensive Thinking, Defending the Pick and Roll the NBA Way, and A Champion’s DNA. Click here to see another sample of his teaching AND for detailed information about purchasing the DVDs at a special price If you need any assistance, email me at [email protected] or call or text 765-366-9673. You might not agree with all of these points, but you should be able to use a few of his points as teaching points for your conversion defense. Being a great defensive conversion team and forcing the offense to play against your half court defense is a major part of being a good defensive team. Make sure that your sound is on and that you click the play arrow to see the video. Coach Eastman’s term for Shrink Spots are help spots. By being in correct help position you shrink the gaps that are available for drivers.